Immediately as the game begun it became clear Chelsea’s approach out of possession would be to structure themselves in a compact 4-5-1 formation from which the team looked frequently for pressing triggers to begin their high pressing. At the beginning of the game, City used their typical 4-3-3 formation when building out of their own half with patient circulation to find a way forward. Morata positioned himself on Fernandinho and then would either press John Stones or maintain his man-marking on the defensive midfielder. This depended on the distance of the central midfielders of Chelsea, as it was normally their role to press out of midfield and toward the central defenders while Morata covers the middle. Once the ball was forced back to Bravo, Pedro initially looked to press out high and early onto Laporte off of Mendy in order to prevent the goalkeeper from playing a simple short pass to the open central defender. This was often exposed though, as Bravo would find the longer diagonal pass through the air and into the open Mendy for City to progress forward. Mendy was able to move past Cesc on the wing and pass into his attacking midfielders who could then switch the ball against the very compact defense for direct dribblings on the wing. As the game progressed Pedro became more patient and waited for Laporte to receive the ball first before pressing onto him, therefore more effectively covering Mendy and more frequently forcing long balls. The idea behind the straight line of 5 in midfield is to be able to send players forward in pressing while still maintaining the presence in midfield. Morata covers Fernandinho, one of the central defenders dribble forward, either Fabregas or Barkley press out to the central defender (depending on which side) at a good angle where they cover the center in their pressing run. This allows the defensive midfielder of City to be more consistently marked, a higher initial presence deeper in the center, and a more effective run toward the ball than a normal 4-4-2 pressing would. Sarri shows himself to understand a basic principle of pressing: cover the center and deep options first and then run out toward the ball on the trigger to press while teammates cover behind. However, another aspect of good pressing was lacking: staggering the lines of the pressing formation to have better coverage of important zones and teammates’ pressing actions. Because the midfield line is so flat, the midfielders have a more difficult time covering the City attacking midfielders between the lines as the ball progresses forward – as opposed to having a true #6 in the defensive midfield zone who could come across the field to press in the defensive halfspaces. As the ball was played to Mahrez on the wing, he could immediately combine inside diagonally with Foden due to Jorginho being higher up the field during pressing. In the early phases of the game, Chelsea was able to maintain an intensity in backward-pressing to close these holes and win the ball for counters before they could be exploited – as the game wore on they became less effective in this. City began to play passes into the wingers more quickly and then play into the runs of the attacking midfielders to get behind using dribbling or passes behind to Aguero using his movement off the back shoulder of the nearest central defender. An interesting development was to watch Mahrez in his role on the right wing, he dribbled inside diagonally while Foden and Walker balanced his movements, and he even occasionally dropped into central midfield to get the ball and dribble forward past the opponent midfield – which is quite a Messi-esque role. The first goal came from a weakness in Chelsea’s pressing which City did very well to exploit in the early stages of the game. Using their central defenders as bait in the 2-1 triangle they form with Fernandinho, they would pull out Chelsea’s central midfielders before switching the ball to the other central defender or play into Fernandinho depending on if Morata left him to press one of the central defenders. This means from the 4-5-1 City lured out Morata and 2 central midfielders, leaving holes to be exploited through the center – if a winger moved inside to cover, there would be an opening on the wing. This is a masterful example of the fundamentals of positional play: using the 2-1 triangle to pull out opponents and break lines. The ball could then be played long and diagonally toward the wingers for direct dribbles or passes through the midfield into either Bernardo or Foden to dribble at the Chelsea defense. Foden dribbles forward and lays it off to Aguero at the top of the box to score the first goal. After the goal City went through a phase where they were less patient in circulation during build-up. They forced the ball forward more often and looked to play down 1 side of the field even though a switch to the opposite central defender is open to attack the more opened side of the opponent block. This resulted in more long balls and clearances from which Chelsea could win the aerial duel and launch counter-attacks. Walker and Mendy’s value in these cases became very obvious as it was difficult for the Chelsea wingers to bypass the fullbacks even in advantageous counter-attacking situations. A clear from City’s first season was selling the older fullbacks and the club and buying these two players for controlling counter-attacks. After the water break City’s circulation improved in the back line as they began to pull out Chelsea’s central midfielders with more patient circulation. During the 2nd half where Mahrez was moved to the left wing, Mendy began moving higher up the wing (previously occupied by Sane) while Walker remained deeper. This formed a sort of 3-1-5-1 formation with 3 attacking midfielders and Mendy and Bernado on the wings. The back 3 in possession made it more difficult for City to expose Chelsea’s pressing as well as they did in the back 4, but it was an interesting variation to see – it is likely that we see this back 3 system more often this season should Mendy remain healthy. As the game went on the build-up began to deteriorate again – though this didn’t have too big of an impact due to City’s dominant pressing game. In possession, Chelsea played in a 4-3-3 formation with a playful attitude – looking to build out from the goalkeeper even under intense pressure – slipping passes past the pressing runs of opponents and playing low passes into the striker for combinations. High pressing and building out from the goalkeeper are common qualities in a Sarri team – and it will be exciting to see how the team develops. Their counterpressing was much worse than City’s, therefore City had much more dangerous counter-attacks when combined with the fact that City’s pressing was on a higher level than Chelsea’s – resulting in more ball wins. 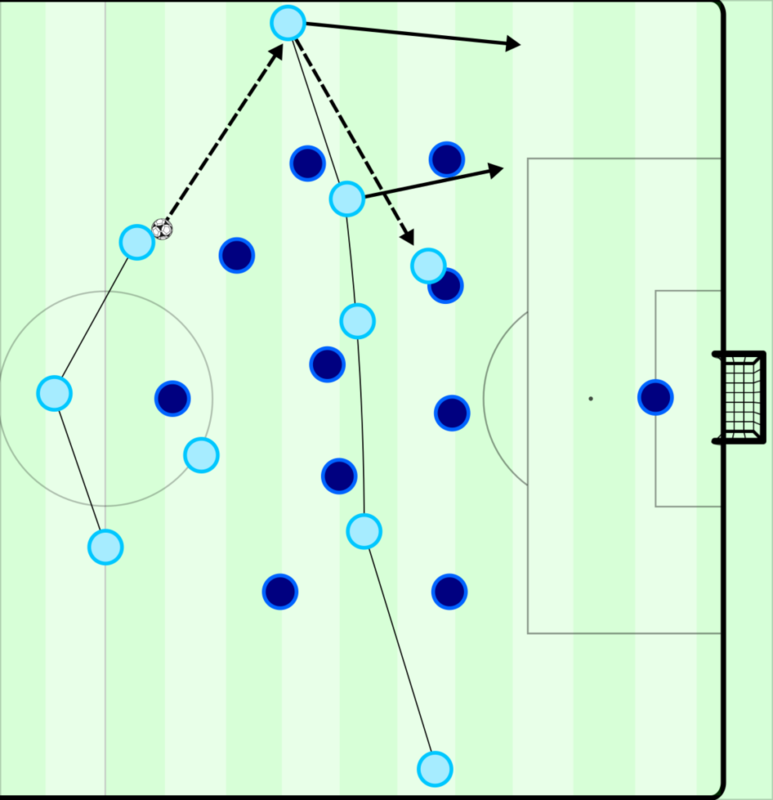 City’s pressing mechanism was to move the wingers into the halfspaces like wide central midfielders, and to have Bernardo (left attacking midfielder) join Aguero in the front line pressing the 2 central defenders while Foden (right attacking midfielder) moved onto Jorginho to man-mark Chelsea’s 2-1 triangle in build-up. This tight pressure forced frequent mistakes from Jorginho and allowed City to create dangerous chances from higher, more direct counter-attacks. Using this structure out of possession, the ball was obviously forced into the open fullbacks of Chelsea most often. The wingers would wait for the pass out wide and then press with speed while Fernandinho comes across and covers the near halfspace. The speed with which City arrive at the wing and the intensity and aggression with which the surrounding players collectively collapse on any pass inside of their defensive block is at a very high level. The main problems which arose within this scheme were Mahrez being too slow when moving out to press his wing, and Fernandinho not always covering the near-side halfspace – forcing Bernardo or Foden to drop back from higher positions to cover open holes and gift Chelsea a back-pass option. Chelsea initially found it more difficult to play past City’s compact 4-diamond-2, and so Barkley began to make runs forward next to Morata so the central defenders and fullbacks could play longer high passes in build-up for Barkley and Morata to compete for against Laporte and Stones. 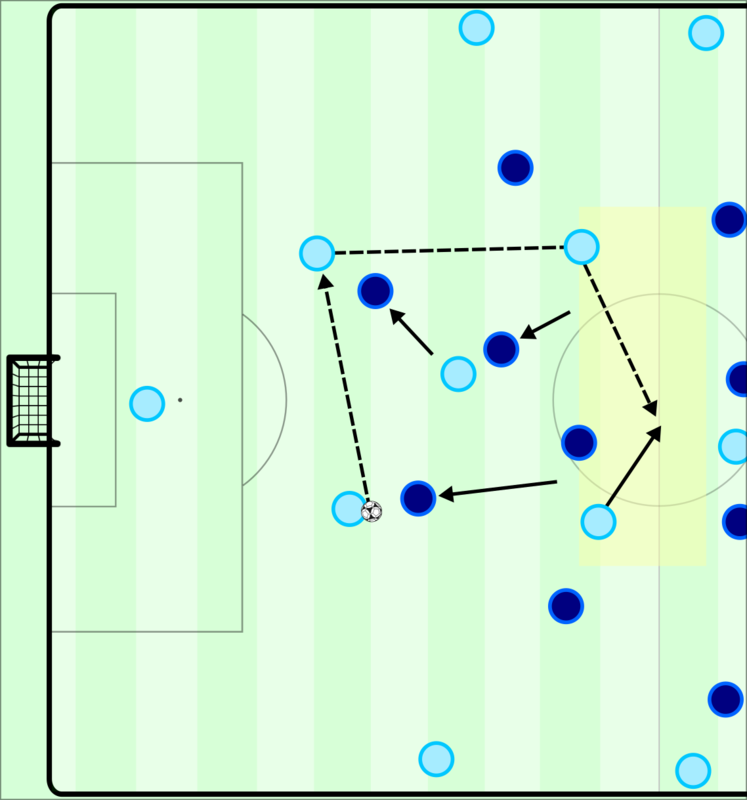 Of course, the approach didn’t work every time – but Chelsea began to bring the ball down in City’s half more often using this method, pushing Guardiola’s team closer to their own box. Due to longer high passes being more frequent in English football, Guardiola’s team are pushed deeper into their half more frequently than at his previous clubs – but with compact and intense pressing it allows his team to launch far more counter-attacks from deeper positions than in the past, exploiting the open space with the speed of his forwards. Ultimately, the long balls didn’t yield any results. Chelsea had to find a different way past City’s pressing – and they found it through luring out the wingers to press their fullbacks and expose the fact that Fernandinho was not shifting across fast enough to cover the near-side halfspace. This allowed them to find short passes into their #8s (Cesc, Barkley, Drinkwater) in the near halfspace from which the central midfielders would look to play passes behind to the strikers. At one point Mendy even left Pedro on the wing alone to cover up the short pass into Cesc in the near halfspace, which Chelsea quickly exploited as Cesc laid the ball back and Jorginho played the winger behind the defense. In the end, Chelsea still wasn’t able to exploit these situations on the wings with dribbles or crosses and Walker and Mendy defended very well and the crosses were cleared out by the central defenders. There were other interesting aspects in the game, such as the goal kick structure from Manchester City where Walker was the right central defender, Stones and Fernandinho a double pivot, and Laporte the left central defender. Foden would move out to the right fullback position while Bernardo and Aguero would look to play int he attacking midfield areas as Sane and Mahrez remained high on the wings. City’s pressing of Chelsea’s goal kicks was also interesting, with Bernardo, Aguero, and Mahrez forming a front three and Sane, Fernandinho, and Foden in the midfield with both fullbacks pressing high. The season ahead looks very fun and very interesting, with the EPL teams getting even more talented in regards to both players and coaches. City still looks like the top team in the country, it will be very tough to knock them off their perch.